I’m not a big fan of buffets. Sometimes they can be nice but a lot of the time it’s an exercise in choosing the dishes that are worth eating. They are generally a lot more expensive than eating a la carte and one often ends up eating too much and feeling very uncomfortable. Often the food has been standing out for a while and a lot of the dishes are not great quality to begin with. This last Sunday, at Catharina’s at the Steenberg hotel, I had the pleasure of experiencing the best buffet of my life so far. It is priced at R180 per head and it’s worth every cent. The selection is enormous, but what differentiates it from other buffets is that each and every dish is made perfectly. Each section had original dishes, rather than the tired old traditional buffet dishes. For instance, the salad section allows you to create your own salad from a huge selection of fresh ingredients. The fish on offer included seared tuna, smoked butterfish and grilled mackerel in addition to a selection of calamari and shrimps. Each and every dish was tasty, fresh, well made and well presented. I tried the lamb, beef and pork. Each of them tender and moist. The crackling on the pork was the best I’ve had. The veggies were in good shape, not soggy. The potatoes were nice and crisp and the gravy hot. The desserts were phenomenal. The malva pudding was moist and light. The chocolate eclairs melted in my mouth. The chocolate mousse was in another league and the cheese cake made my tastebuds feel like they had died and gone to heaven. I couldn’t fit in any more otherwise I would have tried the other multitude of desserts and even smashed some cheese and biscuits. The wines are of a high standard but quite expensive. We drank a very nice red at R150 a bottle and there wasn’t much cheaper than that. The service was good, there are enough waiters to ensure the plates are cleared timeously and other requests attended to. It was not a cheap lunch, but the setting is beautiful (have a look at some pics in the gallery) and the buffet is really at another level. If you’re looking for something for a special occasion, you’ve just found it. My first visit to Catharina’s was for the Sunday buffet (R195 – with live jazz) and it was fantastic, last night I went and ate a la carte. I was planning on having their winter special (see the list here) but there is only one starter, main and dessert on offer which is not much choice. Once I looked at the menu I knew I couldn’t settle for the special with so many exciting dishes available. For starters I had the cream of mushroom soup (R55). I know it sounds boring but it was excellent and flavourful, nothing like a good soup on a cold night especially with bread baked on the premises. My parter had the prawn ravioli (R95) which was mind blowing, a flavour extravaganza of note. It came on king oyster mushroom and mange tout stir fry, and was topped with tempura fried soft shell crab. I had definite starter envy. We drank wine by the glass as we were eating very differently, I started with the Steenberg Bordeaux blend (R30) and moved on to a glass of the Steenberg Catharina 2006 (R85) with my main. There is a very good reason for the price difference, the first glass wasn’t great but the second felt like it had been made for me. My partner enjoyed two glasses of the Steenberg Sauvignon Blanc (R28). For mains I had the loin of Springbok (R150) served with some sort of oxtail parcel which I didn’t like. The springbok was excellent, prepared to spec and lovely and tender. There were no heavy sauces so the flavour of the meat was accessible. But despite enjoying the springbok, I had food envy again. My partner ordered the Roast fillet of Franschhoek salmon trout (R130) which came on a bed of prawn risotto and was accompanied by seared scallop, asparagus souffle and basil oil. Again, this was an amazingly flavourful dish with none of the flavours dominating too much. I was getting tired of ordering the wrong thing so suggested to my partner that she choose a dessert and we share it. I was quite happy with the chocolate variation (R70) we ordered which had three small chocolate desserts including a pot de creme which I have never had before (very nice!). The service was attentive and knowledgeable, but there were only about five tables so that could change under pressure. Catharina’s is a lovely spacious and luxurious restaurant. We were seated next to the fire (see the list of restaurants with fireplaces here) which was a treat on a cold wintery night. This visit reminded me how lovely the setting is, I’m dead keen to get back and have lunch outside. They also have a private dining room with a 16 seater table as well as some smaller tables, seating up to 26 people in total. It’s quite an expensive restaurant and depending on what you order, it might not feel like great value. My partner’s selections were worth every cent whereas mine were not as good. The service and setting do count for a lot though. I liked that they added a line to the bill for you to insert a Streetsmart donation, although they should tell you what it is for (unless there was a card in the bill folder and I didn’t notice it). As part of their new Spring menu, Catharina’s has a special menu on Mondays in support of Meat Free Mondays. It’s a vegetarian 3 course gourmet menu for R165. Sample menu options are Waterblommetjie Risotto with deep fried Potatoes, Roast Onion Beignets, Sour Apple and ‘Surings’ Compote. Now, I don’t know what half that stuff is but it sounds like it should be tasty. So all those vegetarians out there who feel like they are getting the short end of the stick, this is your chance to spoil yourself (your omnivorous friends need not panic as the usual menu will also be available). I was fortunate to enjoy lunch and dinner at Catharina’s the other day when I stayed over at the Steenberg hotel (review of that soon). Standards have not dropped, I’m still really impressed with this restaurant. For lunch we all had the same thing as a set menu. Starting with veal sweetbreads and oxtail marmalade tart accompanied by sweet corn velouté, grilled prawn, pickled mushroom and corn & mange tout salad (R105). Mains was springbok loin, braised shank, sultanas, spinach tortellini, seared asparagus and a herb & red wine jus (R165). Lunch ended with a chocolate trio of dark chocolate marquise, milk chocolate frangipane tart, white chocolate raspberry mousse (R50). For dinner we all had the Ceasar salad to start (R65). I like to order the Ceasar salad, kind of a tool of comparison. It was exquisite. For main I had the linefish with crushed Nicola potatoes, calamari, prawn & mange tout stir fry, confit tomato and bouillabaisse broth (150). My one dining partner went for the assiette (that’s French for assortment) of Karoo lamb which was braised shoulder with pea, edamame beans & mushroom salsa, lamb loin with vegetable terrine, shank rillette with grape & tomato compote, fondant potato, lamb jus (R160). My other dining partner had the Warthog loin, braised belly, butternut gnocchi, sauté baby spinach, gorgonzola cream, shemeji mushrooms and Catharina jus (R155). I have detailed the dishes so that you can see the depth and complexity. We were blown away, luckily the tables are fairly far apart so the other tables didn’t have to hear us raving on and on about the food. We were full but decided to order dessert anyway. We weren’t blown away by the desserts, only finishing one of them. Out of all the food, this was the only element that was lacking. The service was excellent, the wine list is great (we drank the Steenberg nebbiolo because it’s just so beautiful) and the venue is fabulous. The bathrooms are incredible! 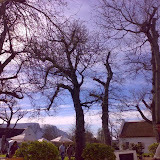 I think a lot of focus in the Constantia area goes to La Colombe and Uitsig and the Greenhouse, etc. But really, Catharina’s is an awesome experience.